The 2017 SOC Doubles Tournament finalists. The 2017 All-SOC tennis team. Over the years, the Wheelersburg Pirates have worked hard to establish and maintain excellence in, well, pretty much everything that the school has participated in over the years. Whether it’s been baseball, softball, football or track and field, Wheelersburg has proven to be a force in everything that the Pirates have fielded over the years. 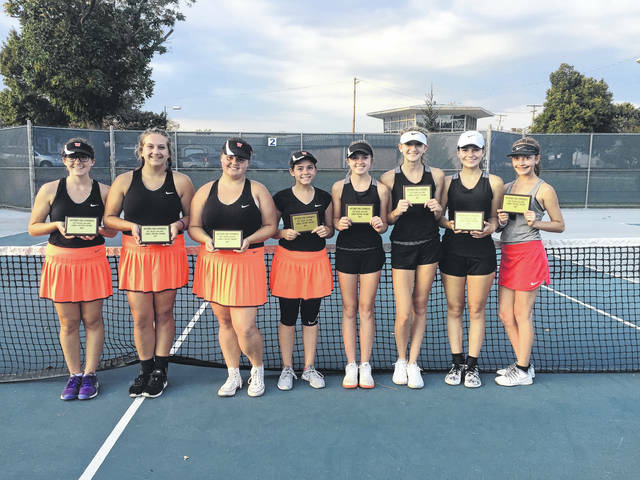 And over the latter half of the week, the Wheelersburg tennis program has proven that they, too, are a force to be reckoned with in SOC action. Wheelersburg, who claimed the SOC regular-season title in the tennis ranks this past season, showed no signs of slowing down throughout the SOC Tournament as the Pirates, behind the play of Lea Wright and the doubles tandem of Maddie Gill and Kaitlyn Sommer, collected the SOC Singles and Doubles Tournament Championships en route to leading the Lady Pirates to yet another clean sweep of the main tennis accolades at the William E. Daehler Tennis Center on the campus of Shawnee State University. For Wheelersburg head coach Jodi Wright, the championship, which comes off of the hard work from a concentrated and dedicated group of girls, is simply a blessing. A lot of talent, indeed. For starters, take Wright’s daughter, Lea, who is a co-captain of the Lady Pirates’ squad. Lea, who got a first-round bye as the No. 1 overall seed in singles action, didn’t lose a single set in a quarterfinal match against Hope Wilburn of Waverly, and, after outlasting Alli Entler, 7-6 (7-1), 6-2, the junior was able to round out her outstanding SOC Tournament run by only losing one set to Kaylee McGinnis of Minford in a 6-1, 6-0 championship-winning match result. 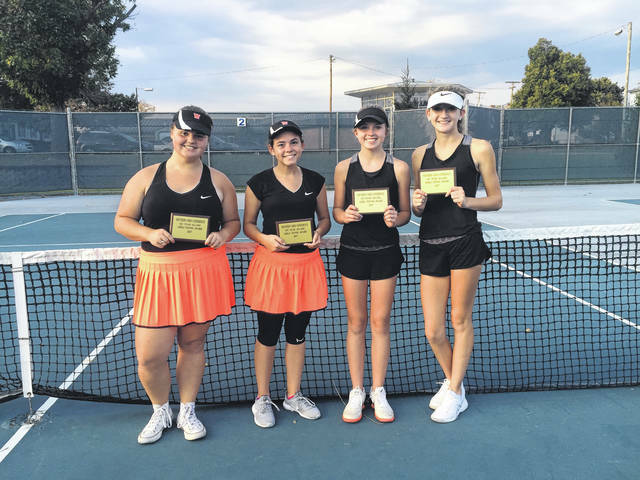 McGinnis, another exceptional junior with top-flight talent, had only lost one game in her prior seven coming into the SOC final, including a straight-set victory over Valley’s Taylar Copen and a 6-0, 6-1 win against fellow Wheelersburg hand Cadie Jenkins. On the doubles side of the coin, the play of Kaitlyn Sommers and Maddie Gill, who combined from their No. 2 and No. 3 singles positions to form a doubles unit for SOC play, showed similar signs of wherewithal in controlling play for the Lady Pirates as the pair, after collecting a straight-set victory to open up play, defeated a strong Notre Dame effort in Maggie Whitman and Molly Hoover, 6-4, 6-2 in the semifinals and repeated the feat against Heidi Lamerson and Shanda Nibert in the finals. Overall, the lead trio of Wright, Sommers, and Gill — who are of junior, sophomore, and freshman eligibility, respectively — won an astonishing 73 of the 88 sets that the trio participated in throughout the SOC Tournament. However, the aforementioned trio certainly weren’t the only Wheelersburg tennis players to star on the evening. 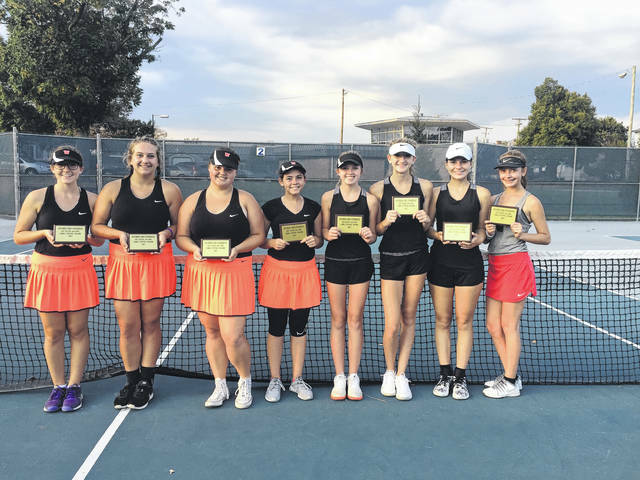 In fact, Cadie Jenkins and Victoria Thomas, who starred throughout the year as the Lady Pirates’ top doubles tandem, each won a match in singles competition to advance to the quarterfinals. Thomas defeated Minford’s Molly Downy 6-1, 6-1, while Jenkins collected two thrilling sets over Notre Dame’s Katie Paterson (7-6 (7-4), 7-6 (7-5)) in a highly-contested and well-played match on both sides. 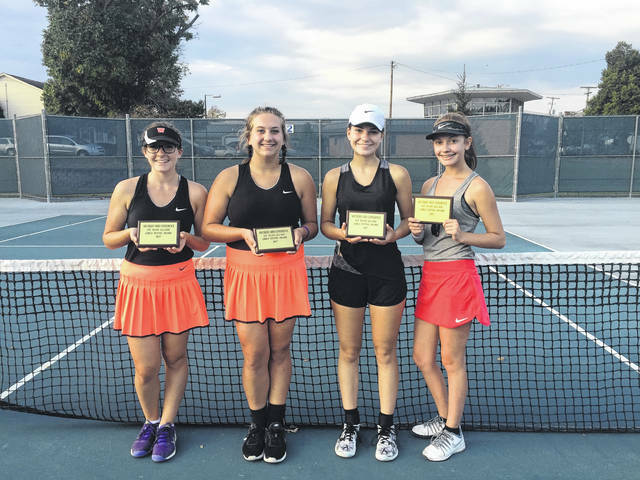 With an SOC title in the books, Wheelersburg, behind its highly-skilled quintet and nine additional talented hands, have the potential to make quite a bit a noise when the Division II Sectional Finals begin on Tuesday at Portsmouth High School.